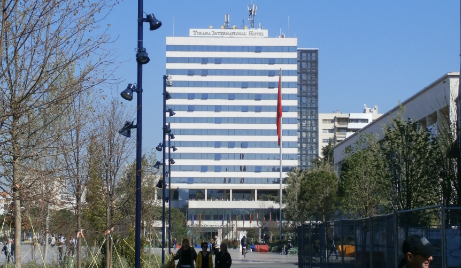 The Tirana International Hotel is located at City Center, Rruge Devijimi Nr.8, Tiranë, Albania. This was the first hotel my wife and I visited during our two week tour of Albania, Montenegro, Croatia and Slovenia. The hotel is conveniently located at the heart of Albania's capital city, Tirana. Built during the communist era, the building was known to the locals as "fifteen story" when they wanted to designate a meeting place without the secret police knowing where they were meeting. It has been renovated to be a welcoming hotel in a country that is continuing to develop. We were provided a shuttle to the hotel, so we were not in need of parking. The hotel does have a parking lot as well as exterior security personnel. The staff at the hotel were incredibly friendly, getting us quickly checked in and assigned a room. Some of the countries we visited do not mandate the hotel retain your passports. Albania does. So we surrendered our passports, received our room keys and proceeded to our room. The room was a bit small, but comfortable. It also offered a great view overlooking the main square in Tirana. There weren't a lot of options for charging phones, cameras or laptops. There were exactly two available outlets. Luckily, our international adapters offer additional charging ports as well as our USB adapters allowing for two plugs. Between the USB chargers on the side of the international adapter and the two ports on the plug adapter, we had plenty of room to charge devices. Pro tip: pack adapters that charge multiple devices. If you rely on standard plugs, your options may be limited. In the bed photos, you can see the lamp tables (night stands) on either side of the bed. One spare outlet was available behind each. The tables provided a small, but adequate platform for the devices we were charging. Our stay included the breakfast buffet. We also enjoyed dinner at the hotel restaurant our first night. The food was good and offered plenty of options. The bacon took some getting used to (European bacon, in general, is more like ham). The spread include fresh bread, jams, bacon, eggs, olives, cheeses, sliced meats, torts, yogurt and more. There were two options for coffee. The coffee machine provided a freshly brewed set of options, but there was sometimes a line. Alternatively, you could use the coffee pot, which was a bit cold for my liking. There was also a juice machine with two options for juice each morning. The spread was more than adequate to find a filling breakfast to start the day. The hotel is also centrally located, with plenty of restaurants and shopping in walking distance. There is also a mall and a market just a few minutes away. The hotel is located on the main plaza, with the ethnographic museum located next door, the opera house (currently under construction) located in front of the hotel and other sights a short walking distance away. My only complaint with the hotel was the shower, which was tiny. As with most European showers, the floor was destined to become soak and wet during the course of a shower as well. Bath mats serve more to absorb excess spillage than to provide a dry landing for your feet following a shower. I was okay with the small room size, but the tiny shower was a bit too cramped. Hopefully, as the country experiences more tourism, the hotel can renovate again and improve the room/shower size. As is, the hotel is still very nice. It is attractive, clean and has a staff that is very friendly. If you are staying in Tirana, this hotel is a recommended option. All photos are my own, unless otherwise noted. They may be reproduced with prior permission.